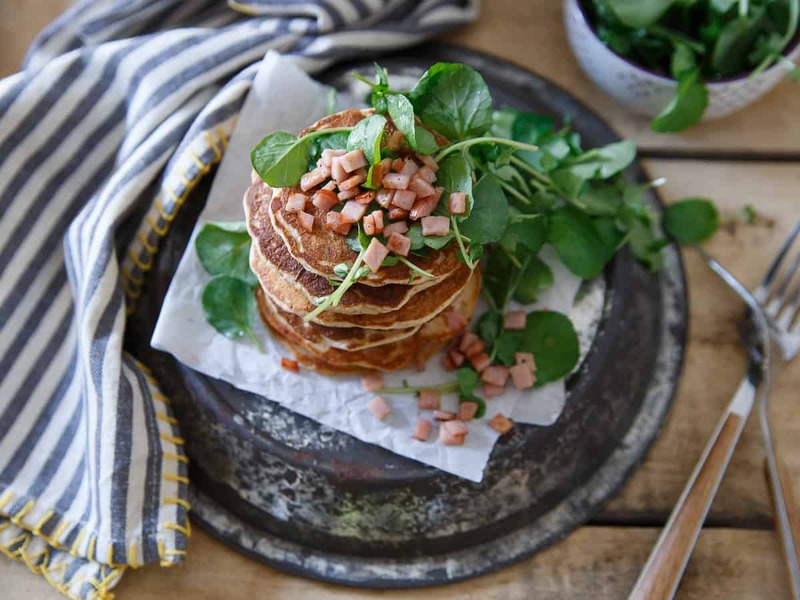 These Canadian bacon pancakes are stuffed full of savory shallots, herbs and Canadian bacon then topped with a crisp watercress salad. Perfect for brinner! I’ve never been as thrown off by day light savings as I seem to be this year. How can 1 freakin’ hour mess up a body so much? I get it now when parents are all losing their ish about their kids sleep schedules because I feel like my body has all Benjamin Button-ed on me and reverted to that of a small child these last few days. *This Canadian bacon pancakes post is sponsored by Jones Dairy Farm, a partner of Running to the Kitchen. All content and opinions are my own. Thanks for supporting! A midnight bedtime seems too early and then I end up waking up flustered at 9:30-10am wondering where half my morning went. I feel like I had just gotten into a good pattern where I was naturally waking up at 7am too without the need for an alarm clock feeling rested and ready to start the day. Now, I’m jumping out of bed after looking at the clock feeling like a train hit me but all crazed because I’ve lost my morning coffee + computer time that usually starts my day off on a productive note. With all this, my meals and meal times have gotten all sorts of messed up too. Does it make sense to eat breakfast when it’s almost lunchtime? You guys, these are big life decisions here. Some days, I just down some coffee to hold me over and go straight to lunch. That doesn’t mean I’m skipping breakfast foods though. It means it’s the perfect excuse to welcome brinner into my day! Jones Dairy Farm might love brinner just as much as I do and has dedicated a whole site to the awesome creation that is breakfast foods for dinner. In my head, brinner is synonymous with quick and easy. It’s a go-to meal when you don’t have time for a long thought out dinner but still want something nutritious and satisfying. It’s also the perfect excuse for pancakes at 7pm. Obvi. Jones Dairy Farm makes it easy to find the perfect brinner recipe with their recipe index, it’s searchable by product type (are you craving bacon, sausage or ham?) and total time to make the recipe so you can find the perfect one for you. 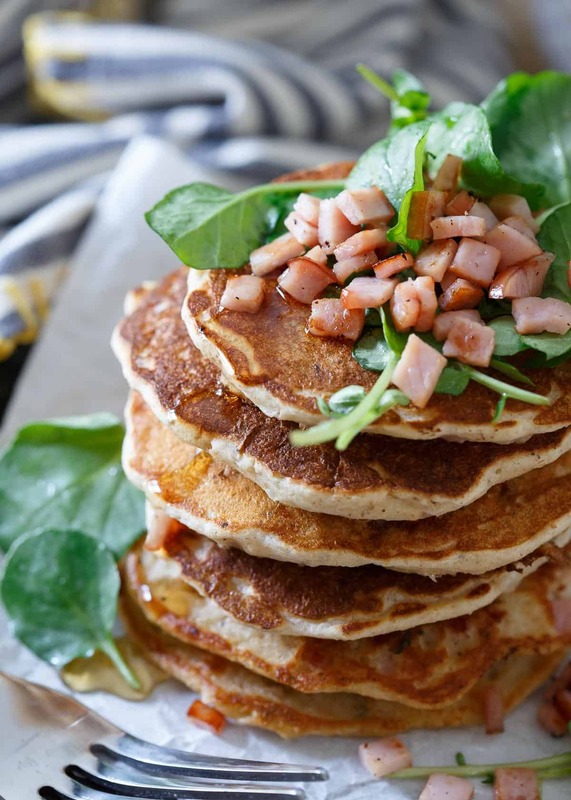 And if Canadian bacon sounds like your jam, these savory Canadian bacon pancakes might just be the perfect fit. 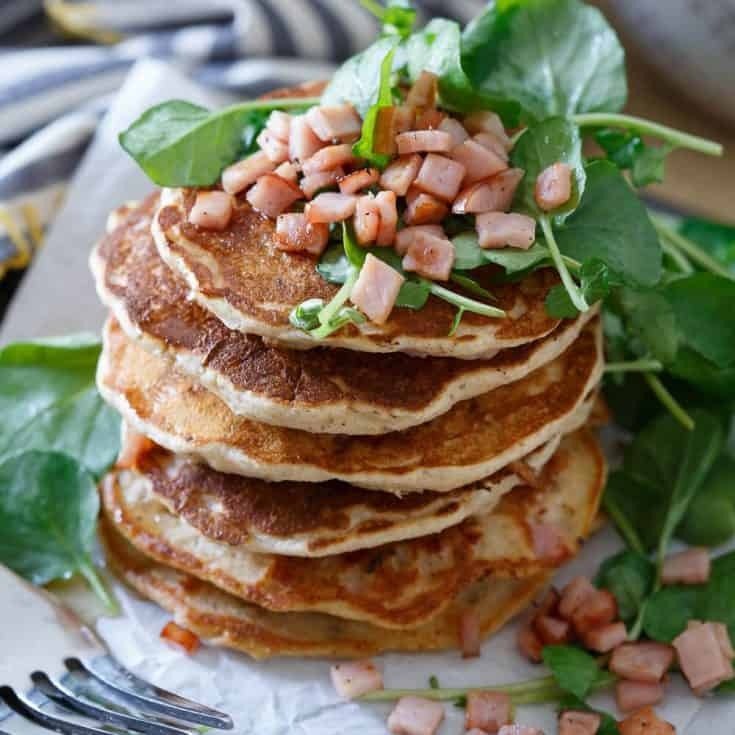 Stuffed with shallots, herbs and of course, Canadian bacon and topped with a light and refreshing watercress salad, you get the pancake craving out of the way while still getting the savory elements of dinner. Use a pancake mix (I adore Kodiak Cakes for their nutrition profile and ease) and this brinner is on the table in less than 30 minutes. If you’re looking for a more protein focused pancake, try this protein pancake recipe as the base (I’d omit the vanilla and cinnamon and probably use an unflavored protein powder or unflavored collagen peptides) and then add in the shallot, herbs and bacon from this recipe for that savory brinner flair! Don’t forget about these herbed cheddar sausage and egg waffle sandwiches if you want to go the sausage route! Prepare pancake mix as directed in a medium bowl. Heat butter in a large skillet over medium heat until melted. Add shallots and thyme leaves and cook for 1 minute until softened and fragrant. Add 4 slices of the diced Canadian bacon to the skillet and cook until browned on all sides, about 3-5 minutes. Transfer the mixture to the bowl with the pancake mix, season with salt and pepper and stir to combine. Add milk as needed until batter reaches a pourable consistency. Pour the batter into pancakes about 3-4 inches in diameter in the same skillet. Cook for 1-2 minutes per side until golden brown and cooked through. Repeat with remaining batter. Once the pancakes are done, add the remaining slice of diced Canadian bacon to the pan and cook until browned on all sides. Toss the watercress with the olive oil and vinegar until combined. Season with salt and pepper. Add the cooked Canadian bacon to the watercress, toss again. 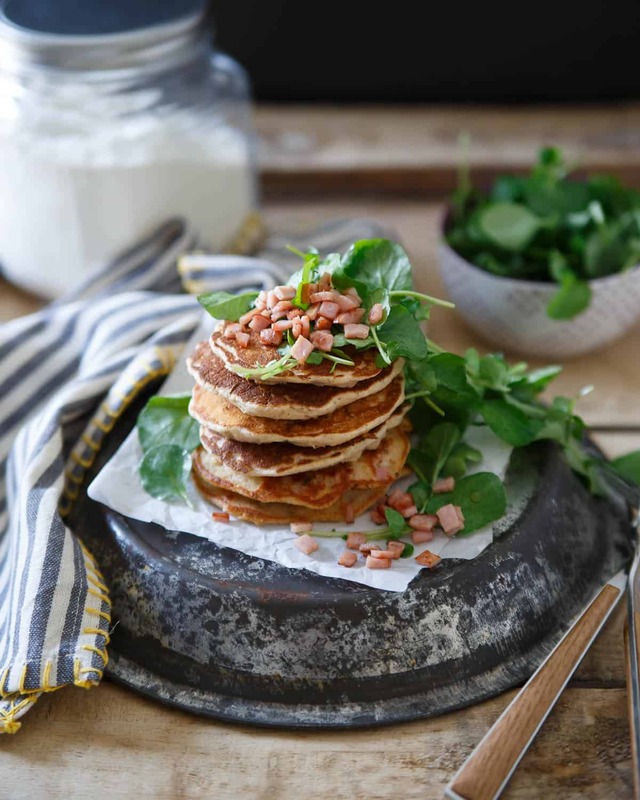 Plate the pancakes, top with the watercress and bacon salad and serve warm. Dear Gina, I feel the same way. I can’t sleep at night, but I feel like I’m pulling myself along throughout the day. Not even coffee is helping these days. These pancakes are perfect for breakfast, lunch (or brunch) and dinner! What a wonderful dish! My kids would be all over this – perfect for a breakfast-for-dinner night. Completely agree! I love reading (and being able to pronounce) everything in the Jones’ products ingredient lists. OMG. DST is WORSE somehow this year than it’s ever been before. And my kids are MONSTERS because of it . . . I may or may not also be a monster. I had to break it to my 8 year old that it will be months before we set the clocks back an hour, that this isn’t really a temporary thing. It wasn’t pretty. These pancakes though! They are spectacular! Bacon belongs in EVERYTHING. Oh I DESPISE DST!!! These however I adore! Savoury pancakes? I’ve never had a savory version of the breakfast classic but that needs to change ASAP! These are glorious! I feel you. I’m in the same boat, I’ve been staying up way too late, and sleeping in too late. I hate feeling like I finish breakfast and my coffee just shy of noon. However, I deem it a-ok for these pancakes to be served at the lunch hour. I adore a savory spin on a sweet breakfast dish. Brinner is ALWAYS a favorite meal at our house and man, Canadian bacon never looked so good. For many reasons, I was super excited about daylight savings time this year (I can shoot photos in the evening after work again — YAY!). But in terms of sleep, it has me all discombobulated. I am still having trouble getting back to my routine. As for these savory pancakes, they look like a fantastic brinner option. Love the combo of flavors!